A brief extension of an unannounced hiatus! By way of apology please accept this picture of my cat, the currency of the internet. There’s an explanation owing for why I’ve been a bit slower on the updates than I like to be, lately. There’s an unfortunately cyclic problem that crops up with lotro, wherein playing inspires me to write, and writing gets me itching to play. Both detract time from the other, and currently, playing is winning out over writing. Still, I’m not unhappy with my pace, and the mental machinery is still arcing out the story that looms ahead, so I’m not especially bothered. However, it’s not any of my four regulars who’ve got my attention snared at the moment. A long time ago, and very improbably, I rolled a runekeeper. You perhaps recall him, he’s been mentioned in passing once or twice. He is the derpy looking individual featured in the picture after the jump. Well. Noticed the retitle? I’m not 100% pleased with it, but then, I choose some horribly pretentious titles to be pleased with, so that’s not really saying much. This is what happens when you get ahead of yourself, I guess! I mentioned that this story was being posted as-written, and you know what, I’m not sure I cared for the experience. There’s some safety in a buffer, and I knew I’d be abandoning that. Get into the North Downs. Sort of got hung up on that second one, which is fine. I’m a character writer, first and foremost, I think, and I’ve always believed that the way to tell a story is to tell it around interesting people. That way it doesn’t matter so much what’s actually happening, as compared to how the characters are reacting to it. So, here are some tidbits. Brassica’s objection to being picked up by big people is tangentially related to what I presume my cat’s objections to be. Here is this person who is multiple times your size, and they are just picking you up! How are you supposed to respond to that! I wish I knew better about the way Sindarin syntax works, because I have no idea if I’m making reasonable analogues in Celebarad’s clumsy overtures in the the common tongue. He’s going to get better, hopefully very soon. Beldrieth is hard to sort out. Llythne isn’t entirely wrong in her assessment, she’s been saddled with a load of children, and she’s trying to keep them all in line. http://www.youtube.com/watch?v=PZ7P1EID7v8 <—- This is why Brassica’s gone off on a rant about bacon in waybread. A kinnie posted this on our FB page and then we had a FIGHT. Wanna know something sad? Poor Torogethir’s character was based on a stock photo, of a smiley dude who turned up when I googled “man in his forties”. He probably wouldn’t have been so cheerful otherwise. I like him though. You know how writers talk about characters getting away from them? He got away from me. You know, it’s funny about Llythne. She’s leaving home too. And she’s come to the edge of her world, and found a kindred spirit at the border. And maybe for just a moment, she wavered on the brink of staying. BUT I WON’T LET HER, WE HAVE THINGS TO DO! ONWARD! Hi Llythne! I was late in getting your character biography up! That’s okay. I did explain how to pronounce your crazy name. Well, that’s the last of the four, for now! I don’t think we see another character for a good long while yet, so my sidebar should be about fixed. I was quite pleased by the shots I took of the burg in the Fields of Fornost. She’s kind of sassy, and it’s hard to capture that in screenshots, but I think it comes across in all of these. Tragically, I’m going to need to theme and frame a new shot to replace the title image of that darn third story, which is going to be renamed to “By the Road Abandoned”. 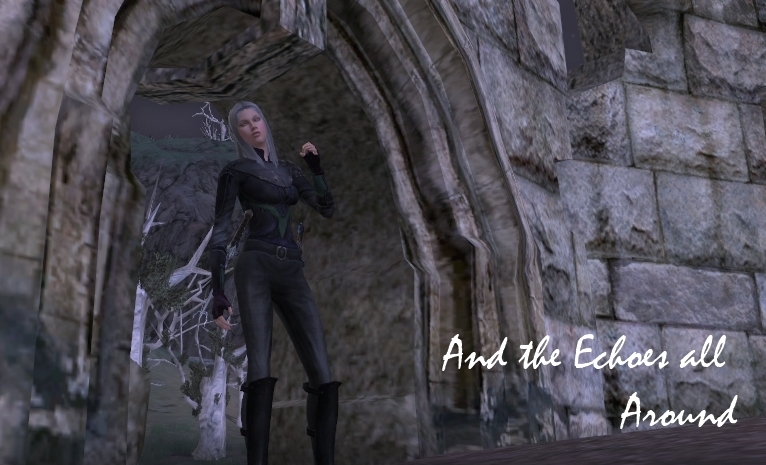 And the real “And the Echoes All Around” which was most of the way completed last night, will likely be up shortly, certainly over the weekend if not sooner. An About page for Llythne. She’s due! It’s important. I’m glad I finally started to explore her character and her backstory a bit, it’s good to have her a bit more solid in my mind. Notes for the as-yet-to-be-retitled AtEAA. Wherein I will explain the original direction I had intended, and break down a few other bits and pieces about the writing of it. A “deleted scene” if you will, or another, very short piece. This was a fragment that was already written, and was supposed to be the core of the previous piece. Again, got sidetracked. That’s something I’ve learned in takeaway from attempting to write a piece without a buffer of at least a few chapters–sometimes it changes on you midway through. 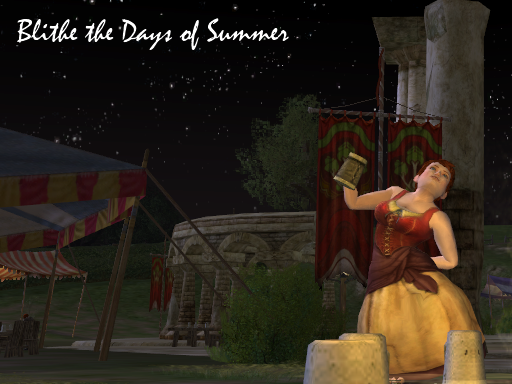 My fourth story, tentatively titled “Blithe the Days of Summer” We’re heading into Breeland! There was supposed to be a larger buffer in between Evendim and our next destination, but I’ve gotta be honest, there’s not a whole heck of a lot I need to say about Trestlebridge. What may happen, emphasis on may, because I’ve only just thought of this now, is a series of shorter vignettes about the journey south. But we shall see. 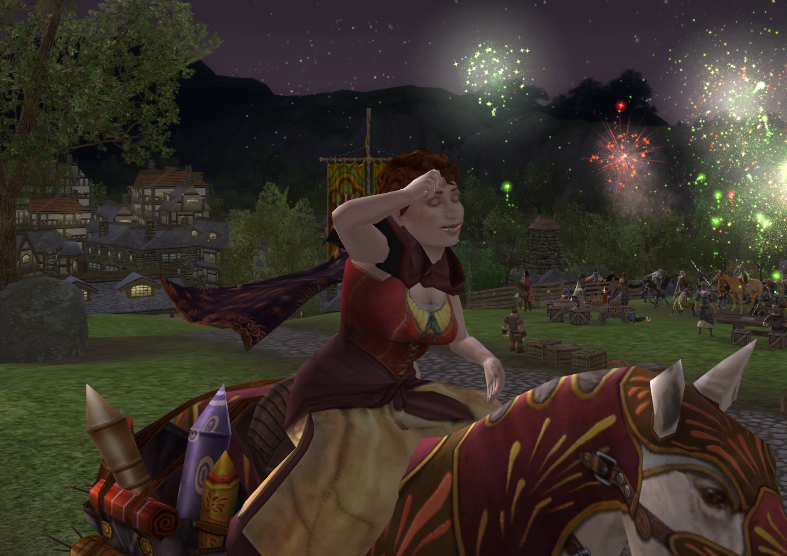 So, my usual thanks to everyone reading, and I hope you’re all enjoying the anniversary festival! I certainly am. I picked up all the Moria maps, and am patiently waiting for the last 4 of the Eriador set. The toons are all doing well. 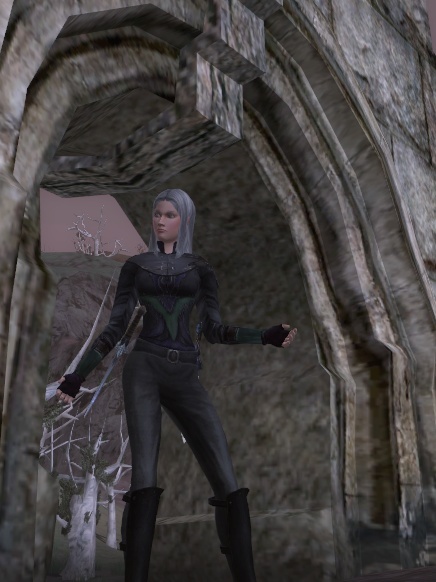 Llythne’s been raiding, even poked her head into Saruman’s tower a couple times. Bel has cleaned up the Great River, is all but fully dragon geared, and she’s the toon I play if I want to do Roots of Fangorn. The Guard is lurking in Mirkwood and barreling towards cap, he’s 66 as of this writing, and geared in a mishmash of bits and pieces of various sets. Brassica just got her first set of masteries! It makes gambit building just a wee bit less daunting. And that’s how things stand for me! Thanks again to everyone reading! I hope to have more up in the not-too-distant future.